Your business and money goals: Self-discipline can make you a better leader and a better manager, help you close more sales and make more money, improve your time-management and problem-solving abilities, and make you more effective and successful at work. 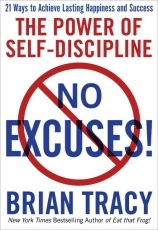 Each of the 21 chapters in this book shows you how to be more disciplined in one aspect of your life, with end-of-chapter exercises to help you apply the "no excuses" approach to your own life. With these guidelines, you can learn how to be more successful in everything you do -- instead of wistfully envying others who you think are just "luckier" than you. A little self-discipline goes a long way . . . so stop making excuses and read this book!